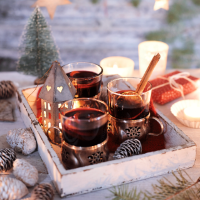 Cinnamon, orange, cloves and a full-bodied red - you know it's Christmas when you have a glühwein. 1. Pour the red wine into a pan and add the honey, the cinnamon stick, the sliced orange or clementines, 300ml water, the cloves, the star anise and the split vanilla pod. 2. Bring to simmer and warm gently for 10 minutes, then add the brandy and stir well. 3. Strain, if desired, into a warmed bowl. Ladle into 6 heatproof glasses or mugs.